Originally from the Scottish Borders, Laura spent much of her early life fishing on the Tweed and learning about plants and trees from her father, a gardener at Dawyck Botanic Gardens. Laura's career as a chef took her to the Isle of Skye (and later Inverness) where she drew inspiration from the island's culinary history and traditional recipes that use the best of the land, the sea and the seashore. Here at The Pierhouse, Laura's cooking is traditional Scottish with a modern twist, utilising fresh, locally sourced, seasonal ingredients wherever possible. As Laura explains "The Pierhouse is perfectly placed to make full use of an incredible range of sustainable fresh fish and seafood fished straight from local waters. Each dish is simply cooked to let the food speak for itself." Away from The Pierhouse kitchen, you might spot Laura, along with her constant shadow Spot the cross collie, foraging for mushrooms in the woods or scouring the seashore with a trowel and a pot of salt for those elusive razor clams! 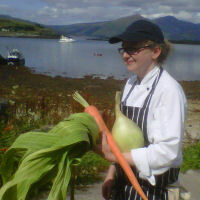 Laura is pictured here earlier in the summer with prize-winning vegetables grown by our langoustine supplier, Hughie Macleod.